The history of the Oomen architects' firm is a long and confusing one, spanning three generations and six architects from one family. 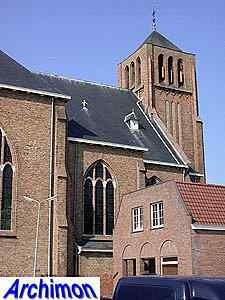 The first generation comprises three brothers, sons of a catholic tanner in Oosterhout, the town were all brothers were born and died. Little is known about their architectural education. One of them, probably the youngest, seems to have attended the school for arts and crafts in 's-Hertogenbosch. Also, they were possibly related to local architect C.A. Oomen who may have been a source of training as well. The Oomen architectural firm was founded in Oosterhout in 1895 by Johannes (Jan) Oomen (1872-1955) who in ca. 1908 was joined by his youngest brother Wilhelmus Gerardus (Wim) Oomen (1879-1963). The second brother Anthonius Wilhelmus (Anton) Oomen (1875-1961) had an architectural office of his own in Oud-Beijerland before or since 1911. In 1919 he moved to Oosterhout and joined his brothers' firm as well. The Oomen office gathered many assignments connected to the Catholic church. 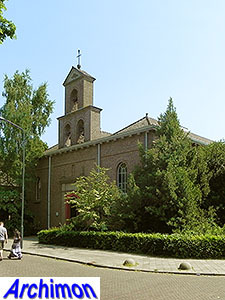 Among these were churches, monasteries and convents, schools and hospitals, often for the Franciscan sisters and probably all in the parts of Noord-Brabant and Zeeland that belonged to the Breda diocese. Many designs were made under the collective name Oomen Brothers, so it is often unclear who designed what. 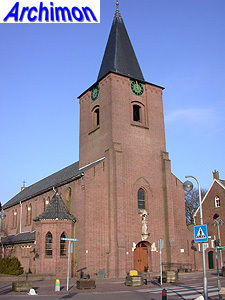 The oldest known assignment of a religious nature concerns the church of St. Antonius in Oosterhout; Jan Oomen elaborated a general design made by P.J.H. Cuypers, took care of the bidding and was probably also the executive architect. A special category assignments came from sugar factories; these had become a specialty of Anton Oomen since ca. 1900, and after joining his brothers his contacts followed suit; he would be employed by the collective sugar factories CSM for over fifty years. The office also has a long tradition, continued until the present day, in the field of hospitals. 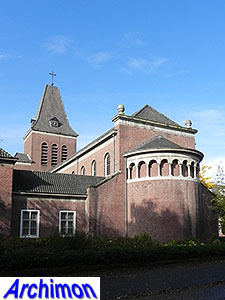 Jan and Wim were responsible for the big St. Ignatius hospital in Breda completed in 1923, while Anton designed the extension of the St. Elisabethgesticht in Oudenbosch (NB) in 1927 and the entirely new St. Antoniusgesticht in Oostburg (Z) in 1931-1932. In 1933 A.W. Oomen's oldest son Bernardus Peter Johannes Oomen (1908-1970), after graduating as a civil engineer at the Delft Polytechnic, joined the Oomen firm. The second son Piet (1909-1934) had briefly joined the office as well but died in 1934 of a neglected cortex, just before his graduation. In ca. 1934 the firm was split, when Anton and Bernard left to pursue their own architecture and engineering office, also in Oosterhout. The reasons for the split are unknown, nor is it known how the two offices coëxisted or how old clients were divided. In 1950 the original firm, for lack of successors, merged with Anton's and Bernard's office, and Jan and Wim retired. Anton and his oldest son Bernard Oomen were joined in 1944 by the third son and brother Wilhelmus Franciscus Johannes (Wim) Oomen (1917-2011). The latter continued the office after the early death of his brother at the age of 62, together with his companion A.A.M. (Lex) Kohlmann, and retired in 1982. In 1976 the office had been joined by B.J.P. 's son Toon who continued to work at the office until his retirement in 2007. Although Toon was the last Oomen to work at the firm, it still bears that name but is currently based in Breda. 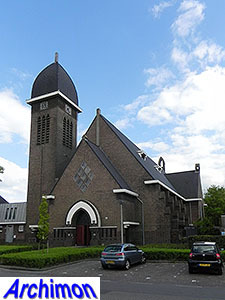 It seems Jan and Wim were the main church architects, making a transition in style from neo-Gothic to (moderate) Expressionism and eventually Traditionalism. Anton and Bernard also designed several churches and chapels, starting with Traditionalism and Bernard eventually ending with Functionalism. The departure of Anton and Bernard is a cause of confusion for the period 1934-1950, when the two offices both existed. Contemporary press sometimes referred to both offices as Oomen brothers, although thankfully in most cases "J. and W. Oomen" is also mentioned. As both offices in this period worked in Traditionalist style mostly, a tradition which left little room for individuality, the works of the two offices are sometimes difficult to tell apart. The following is a list of churches and works for religious congregations of both firms. It is incomplete. Basic design by P.J.H. Cuypers, further elaborated by J. Oomen. 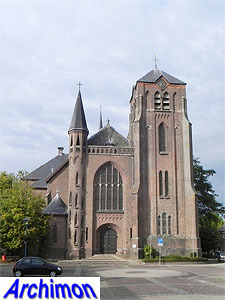 Cruciform church in neo-Gothic style, designed by J. en W. Oomen. Destroyed in 1940, rebuilt in 1941 and again destroyed in 1944. Enlargement of a neo-Gothic church by P.J. 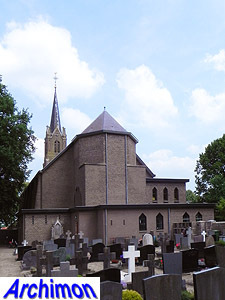 Soffers (1854-1855); choir replaced by transept and new choir with lateral chapels, all in matching style. By J. and W. Oomen. By J. and W. Oomen. Chapel in combination of neo-Romanesque and Expressionist styles, demolished in 1992. 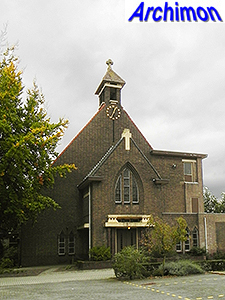 Cruciform church in neo-Gothic style, designed by J. en W. Oomen. Destroyed in 1944. Cruciform church in neo-Gothic style, with centralizing ground plan. Tower orginally with a tall spire. Designed by J. Oomen. Cruciform pseudo-basilica in neo-Gothic style, with centralizing ground plan. Designed by J. en W. Oomen. Tower originally with corner turrets and a tall spire; these were destroyed in WW2. Probably the addition of spaces and chapels to the choir. By J. and W. Oomen. By A. Oomen. Enlargement of J. van Gils' neo-Gothic church (1903). Demolished in 1965. By A.W. Oomen. no further details. Three-aisled cruciform pseudo-basilica with front tower. Attributed to Oomen Brothers. Cruciform church in Expressionist style, by J. Oomen. Various additions to the choir of an early neo-Gothic church by P.J. Soffers. Attributed to Oomen brothers. Chapel in moderate Expressionist style, for a school for missionaries. Designed by J. Oomen. The nave of C.P. 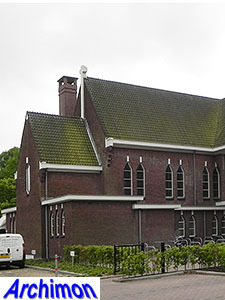 van Genk's neo-Gothic chapel was lengthened with two traves and closed off with a new facade. By Oomen brothers. Basilican chapel in Traditionalist style, by Oomen brothers. Enlargement of a neo-Gothic chapel, by A.W. Oomen and B.P.J. Oomen. Demolished. Complex with chapel in Traditionalist style, probably by W. Oomen. By J. and W. Oomen. Basilica in Traditionalist style, designed by A.W. Oomen and B.P.J. Oomen. Replaced a previous church destroyed earlier in 1940. Designed by J. Oomen. Work stopped by order of the Germans in 1943. Rebuilding of the church of 1912 by J. and W. Oomen. Cruciform church with tower next to the front. Destroyed in 1944. Small chapel in Traditionalist style, built with ruble of the destroyed village church of Ulicoten (NB) on the site of a former border chapel, just on Belgian territory. By J. Oomen. Small church in Traditionalist style, with stepped gable. Designed by J. Oomen. The chapel was demolished in 1974 and reconstructed at a few meters from its original location. Three-aisled pseudo-basilica in Traditionalist style, designed by J. Oomen. Cruciform basilica in Traditionalist style, with two towers at the front and a large square crossing-tower. Designed by J. en W. Oomen. 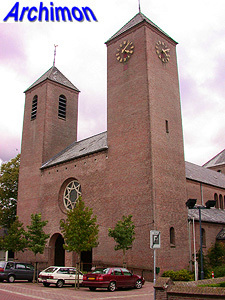 Basilica in Traditionalist style, designed by J. en W. Oomen, with tower next to the front. Replaced their previous church of 1912 on this location which had been destroyed in 1940, rebuilt in 1941 and again destroyed in 1944. Large complex with church, a three-aisled basilica in Traditionalist style. Probably designed by B.P.J. Oomen. Three-aisled hall-church in Traditionalist style, designed by B.P.J. Oomen. Chapel in Functionalist style, designed by B.P.J. Oomen. Demolished in 2005. 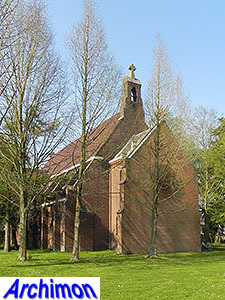 Church in Functionalist style, designed by B.P.J. Oomen. Demolished in 2000.